Figure of a Warrior, late 6th century B.C. 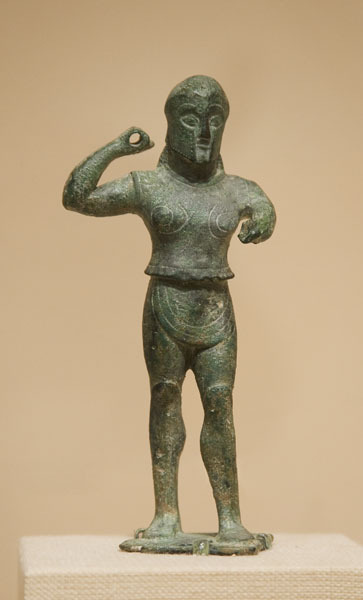 Ancient Greek warriors often dedicated diminutive bronze figurines at sanctuaries in southern Greece as symbols of gratitude for good fortune in battle. This solid-cast hoplite, or infantryman, whose compact form, severe lines, and iconography are characteristic of Lakonian (Spartan) workshops of the late sixth century B.C., was allegedly found at Sparta. Its attacking pose is typical of a soldier striding forward with his right arm raised. The spear and shield he once carried are now lost. His close-fitting cuirass, or breastplate, is incised with spirals that echo the forms beneath, and his short chiton, gathered up about the hips (perhaps for a running charge), bears lightly incised ornamental crosses. To protect his shins the warrior is equipped with greaves. A Corinthian style helmet exposes the figure's beard, while his hair is worn long and falling over his shoulders in typical Spartan fashion.